“Las cosas se arreglan. La gente no.” Things can be fixed. People can’t. Someone I used to work with told me that, after I had been in a fender bender. That phrase keeps running through my mind as I reflect on our day from Gunnison to Leadville, 105 miles via the big meandering Cottonwood Pass and another intersection with the Continental Divide at 12,000-plus feet. Even though I think Felkerino and I tour in a rather posh way– traveling light, hotel stays, dinners out, espresso stops whenever we can– this day still challenged my sense of humor. 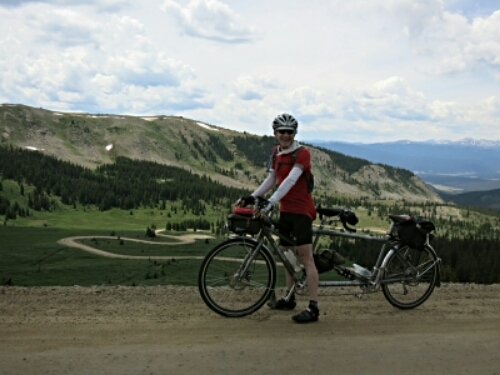 Cottonwood Pass took me away from my troubles and I fell back in love with tandem touring. A helpful shout out of “You’re amazing!” from two motorcyclists helped, too. By the time we reached Leadville, a little grumpiness returned. 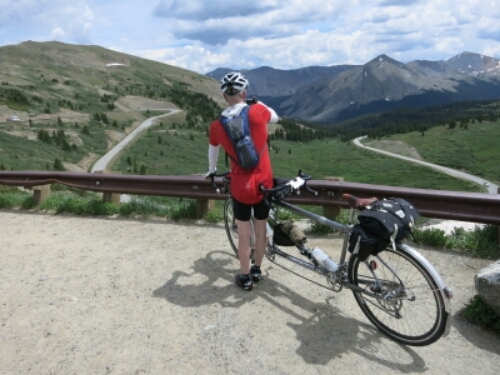 It takes some slogging to reach Leadville. Felkerino and I had lost some of our unison and I was hungry. Two miles from the hotel the bike jerked. I thought Felkerino had slipped out of his pedal. We looked down and saw that a pedal was still attached to his foot and we now had a stub of a crankarm. We couldn’t believe it. This is not an ideal situation, but we are so fortunate this happened in a town that has a bike shop. We were going slowly on a side street, we didn’t fall, and nobody was hurt. We were two miles from our hotel, an easily walkable distance. And tomorrow is a planned rest day for us. We strolled to the end of town and saw a man out working on his mountain bike. He asked us why we weren’t riding our tandem and we showed him our orphan pedal. 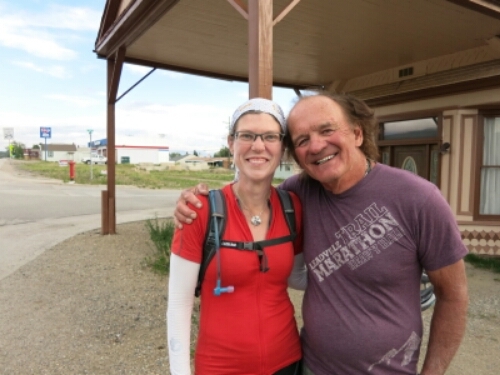 We chatted bikes and then learned we were talking to Ken Chlouber, who started the Leadville 100. No kidding. We never would have talked with him if not for our broken crankarm. I’m not happy about this mechanical, but we are relieved tomorrow is a rest day and optimistic about being in Leadville, a town with what looks like a well-stocked bike shop. Like I said in the beginning, “Las cosas see arreglan” so we will figure out some sort of plan. Good night, all, and thanks to everyone who’s been following and leaving comments. It propels us forward. 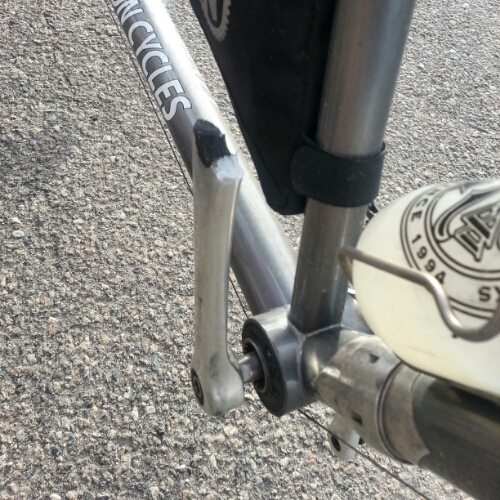 Oh my – been there done that, broken cranks. And I know your tandem is a top end machine, but that crank ain’t so much! Back in the day you probably don’t remember cotter pins and cranks. I went through a bucket load of those babies before we had solid one piece cast crank arms. So like a good stereo, a bike is as good as its weakest components. That would be Felkerino of course, hahaha 😉 But seriously – so cool to meet a legend like Ken Chlouber. Replace the crank arm – and get back out there and up and at ’em. Are you kidding me – this is a dream vacation! At least it was the nondrive side that broke, meaning the repair will be relatively cheap and easy to fix. I’ve ridden a lot of miles, all on single bikes, but never have experienced such a catastrophic failure. KEN!! That guy is so fantastic. I am jealous you got to chat with him! Glad you weren’t too far afield when the crank arm failed. Isn’t that crazy? Thanks for following our little adventure and huge congrats on your 100-miler! Oh wow! Must be the week for mechanicals bc my front derailleur broke off of my frame this weekend. Eek, just saw your derailleur story! Researching that TA Specialites crankset – Phil White has excellent page on same. I have TA chainrings on my Bike Friday. But apparently that Zephyr is discontinued. I just hope a stock Campy or Shimano arm will fit as a temporary patch. Have a sneaking feeling TA may of had issues, as they now do different model. However it just could be bad luck, a flaw in the aluminium during the pouring of the original bar they made the arm from. In F1 race cars they X-ray every component for internal cracks. BTW – I have ridden my bike one legged 5 miles home when I had a SRAM arm fail on me (operator install error with thread). There’s this amazing guy in Africa who races bikes – was born with only one leg! Hope the local store can get you back on the road. wow. talk about providence. and the universe working in your favour. i always cheer you on. sometimes i am unable to comment. but i read your posts, and whether you are on the road in tandem, or in the city on a solo ride, i cheer you on, and hold you in my heart. Sorry about your crankarm, but what great timing! I stayed in the Delaware Hotel in Leadville during a ride from Dillon to Aspen. Cranked up Tennessee Pass with no problem, then got lightheaded running up the steps to the hotel. Altitude does funny things to flatlanders. If you’re headed toward Aspen, enjoy that long downhill into town. It makes the climb up Independence Pass worth the effort. We did not make it to Independence Pass this time. Maybe on a future tour! So who takes the credit…you for the awesome leg power that ripped the pedal off the crank, or Felkerino for the massive forearms that over torqued the pedal and cracked the arm? Certainly a technical with providence dripping all over it. Glad things worked out. Oops. Just saw it was his pedal…dumb. A bad news/good news/bad news post! I hope the rest day is restorative for you and the bike! Wow! I know I’m reading this all after the fact, but I am so glad you two were close enough to a bike shop that this didn’t create an even bigger issue. I don’t even know what my reaction would be on a solo, local ride if my crank arm broke! So crazy. I think my favorite quote thus far (I’m reading backwards, since I’m catching up) is: “You know what this vacation needs,” I thought to myself. “More single bikes and downhill segments!” This is pretty much always my thought – especially the downhill segments part. :O) Ah, life in Colorado (though, thankfully I don’t climb the mountains very frequently).